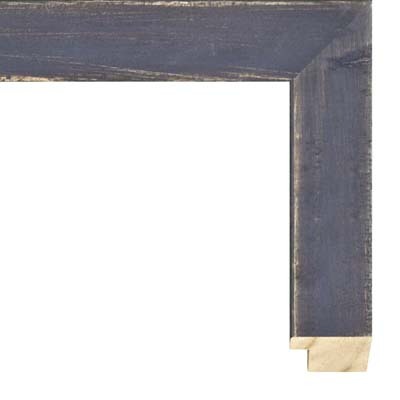 This country rustic weathered blue wood picture frame features a distressed dark blue scraped finish over a finger-joined wood substrate. The profile width is 1 ½” and the rabbet depth is ½”, making this frame ideally suited to matted works on paper such as original fine art prints, giclee prints, posters, watercolors, pen & ink drawings, charcoal, graphite, and crayon drawings, and other paper items. Posters that are most appropriate for this country rustic weathered blue wood picture frame include home decor and kitchen decor, especially farm and dairy themes, folk landscapes, and rustic rural themes. The dark blue characteristics of this frame also pair with cool winter nature scenes and winter wildlife art. Additional types of art that may be framed in this country rustic weathered blue wood picture frame include crochet and needlepoint stitchery, canvas boards and thin rigid hardboard paintings. Technically, a stretched canvas that is ¾” deep or less can also be framed in this county rustic wood picture frame using offset clips to secure the canvas, but keep in mind that stretched canvases that are deeper than the rabbet of the frame will stick out the back of the frame slightly.